Mac and Cheese: Make a healthier version of mac and cheese using spinach, low-fat milk, extra sharp Cheddar cheese, and low-fat cottage cheese. 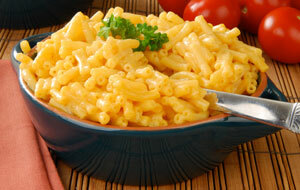 After preparing ingredients and assembling mac and cheese into a prepared baking dish, cover dish and freeze for up to 3 months. Thaw in refrigerator before baking. Sausage Gumbo: Prepare and assemble sausage gumbo using hot Italian turkey sausage links, onion, garlic, Cajun seasoning, flour, tomatoes reduced-sodium chicken broth, frozen chopped okra, and instant brown rice. Cover and freeze cooked gumbo for up to 3 months. Turkey Burgers: After preparing and mixing your ingredients together and forming patties wrap individually and freeze for up to 3 months. Thaw in refrigerator before cooking. Lean ground turkey breast has only 110 calories and 1 gram fat per 3-ounce serving. If you have stand-by recipes that you and your family enjoy weekly, try making them healthier with low fat ingredients and vegetables!